First benefit fund event since ex-Met’s death brings back many memories. The throw was good as soon as it left Lucca Cerullo’s right hand. The eight-year-old from Stony Brook was one of four children who threw out a ceremonial first pitch before Wednesday night’s Mets-Pirates game. Cerullo’s opportunity occurred because of a once-in-a-lifetime person: former Mets great Rusty Staub, who died on March 29. Wednesday was the annual barbecue for the New York Police and Fire Widows’ and Children’s Benefit Fund, a non-profit organization that Staub founded in 1985. 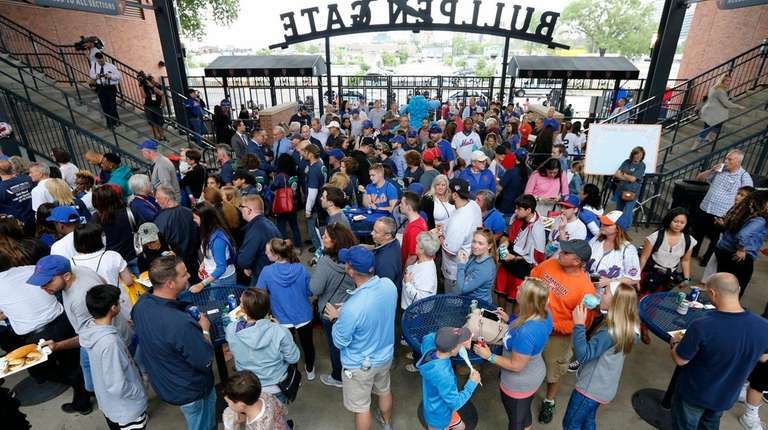 Wright, Darling, Bruce, Jacob deGrom, Steven Matz, Travis d’Arnaud and Kevin Plawecki met with 700 family members, took pictures and signed autographs prior to the game. For more than 30 years, Staub and the Mets have hosted families of NYPD, FDNY and PAPD who had family members killed in the line of duty; first at Shea Stadium, and recently at Citi Field, for the “Annual Game and Family Day”. Norman Cerullo Jr. — Lucca’s father — was just three years old when his father, Norman Sr., was killed in the line of duty while serving the NYPD in Brooklyn’s 79th Precinct in 1978. “I started coming as a kid to some of those early (barbecue) games,” said the 43-year-old Cerullo, who still has an autographed baseball and yearbook from the 1986 Mets team. Staub’s legacy is both far-reaching and incredible. The foundation (www.answerthecall.org) has raised more than $140 million. Families who have been helped because of the generosity and foresight of the man nicknamed: Le Grand Orange.